How much geography can you learn from a novel? In some cases, plenty! Robert Richter’s latest novel, Something for Nothing, is a case in point. Set in the swampy lowlands of coastal Nayarit, it is not only a fun read but provides armchair travelers with an easy introduction to the geography of western Mexico. The book’s author has known this area intimately for more than forty years and his extensive knowledge and deep appreciation for the varied landscapes of this region are evident throughout. 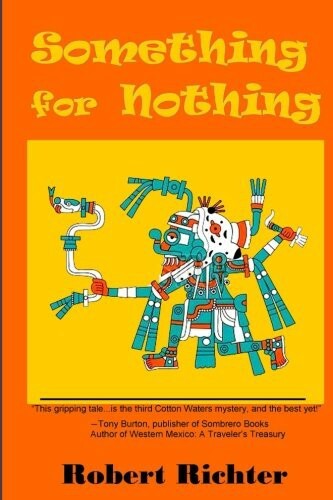 The novel is the third in a series of mysteries starring a small-time hustler named Cotton Walters. This particular tale revolves around archaeologists, drug smugglers and a motley crew of colorful local characters. The history in this novel is entirely believable, and the plot entertaining, but it is the descriptions of the area’s geography that we focus on here. We took an oyster shell road out a back street of Sayulita, not headed out toward the highway, but around a jungle-covered lava spill south into the bosque toward Punta Mita and the northern point of Banderas Bay. Today, that road is driven by Vallarta tourist families in rented Chevy Blazers to luxury hotels. In the winter of ‘72, it was a deer trail that died in an arroyo somewhere in the heart of darkness. Under old growth rain forest canopy we pried boulders out of the way, chopped through windfall palm trunks, and pushed on into an ever-closing tropical wilderness. … Then suddenly, we entered a clearing under giant iguerra blanca trees and towering palms, draped with vines like decoration and full of grackle cries and parrot song, warblers answering and magpies chattering. Beneath the cathedral-like canopy, a village of stick and thatch huts appeared in the mist and smoke of kitchen fires. Dogs and naked children paused in mid-play to stare at the strange metal monster wheeling in from the twentieth century. I crawled back to Miguel in the stern, pointing and screaming, “Navy! Navy! Ándale! We have to reach the first islands!” Miguel opened it up and cut sharply for shore and the first open passage of river between delta sand spits and jungle-covered islands. I’ve had the pleasure of eating in the Restaurante McDonad’s of San Blas on several occasions, and, as always, Richter’s powers of observation and description are spot-on. How much geography can you learn from a novel? Plenty, especially if it written by an observer such as Robert Richter who has such an obvious love for, and deep knowledge of, the locales described. A previous post noted that Mexico’s very wide range of ecosystems make it one of the six most biodiverse countries on earth. We also looked at the states in Mexico with the greatest biodiversity. Given its deserts, it is not surprising that Mexico ranks first in the world in cactus species and second in reptile species, behind only Australia. Mexico’s tallest cactus is the Pachycereus pringlei (cardón), a relative of the saguaro. It can grow to a height over 19 meters (60 feet) and 1 meter in diameter (39 inches). The largest reptile is the crocodile which can grow to 5 meters (16 feet) in length and weigh over 400 kilograms (880 pounds). In recent years, several Mexicans have been killed by crocodile attacks. Largely as a result of Mexico’s diverse tropical and subtropical forests, Mexico ranks fourth in the world with 30,000 different types of flowering plants, compared to only 18,000 in the USA and 12,000 in all of Europe. It also ranks fourth in number of amphibian species, which thrive in Mexico’s tropical rainforests. Mexico is also among the top ten in fern and butterfly species. The temperate forests also harbor significant biodiversity. Mexico has more species of pine trees and oak trees than any other country. However, with deforestation, some of these species may be endangered. Most people are very surprised to learn that Mexico is among the top three in mammal species, along with Indonesia and Brazil. Some of Mexico’s mammals are majestic like the jaguar, some are rather large like the tapir, but many are small and less impressive like bats, shrews, and rodents. Extinction of endemic Mexican mammals is a serious concern. The International Union for Conservation of Nature (IUCN) has listed 11 endemic Mexican mammals as “critically endangered”; 27 as “endangered”, and 14 as “vulnerable”. Q. Mexico is one of the six most biologically diverse countries on the planet. But which states in Mexico have the greatest biodiversity? A. In general, the southern states (which receive the highest amounts of rainfall) have the greatest biodiversity: Chiapas, Oaxaca, and Veracruz. To answer this question in more detail, it is useful to look at different types of plants and animals. Mammal species are fairly well distributed throughout Mexico. Three of the wettest states lead in number of mammal species. Chiapas has 205 different species followed by Oaxaca (194) and Veracruz (190). Interestingly, the next highest rated states are in central and northern Mexico: Jalisco (173), Michoacán (163), San Luis Potosí (152), Tamaulipas (145), Puebla (144), Durango (141) and Sonora (139). All states have over 70 mammal species, except for the relatively small states of Aguascalientes (40), Tlaxcala (50) and Guanajuato (65). 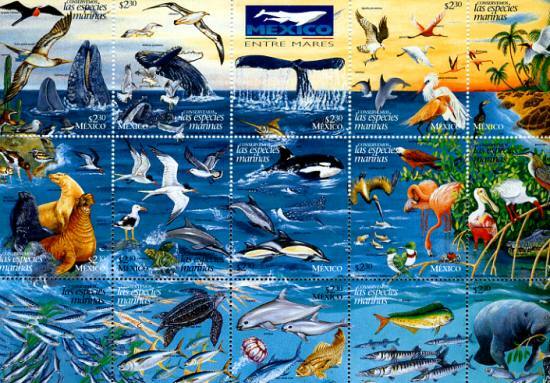 Mexico as a whole has an impressive 901 mammal species; this figure places it ahead of all other countries. Mexico is a bird watchers paradise. Veracruz and Oaxaca lead with 635 and 634 different bird species. Chiapas is third with 565 bird species followed by Sonora (445), Jalisco (438), San Luis Potosí (438), Tamaulipas (435) and Michoacán (429). Tlaxcala (86) and Aguascalientes (88) have the fewest number of bird species. Mexico’s 808 different reptile species places it second, behind only Australia. Relative wet states lead in number of reptile species: Oaxaca (258), Chiapas (224), Veracruz (214) and Guerrero (158). However, the more arid states also have relatively large numbers of reptile species: Sonora (137), Chihuahua (118), Baja California (80) and Baja California Sur (68). Aguascalientes has only 17 reptile species. Amphibians are very abundant in the wet southeastern states. Chiapas leads with117 amphibian species in followed by Veracruz (109), Oaxaca (106) and Hidalgo (66). Not surprisingly, there are very few amphibian species in desert states. 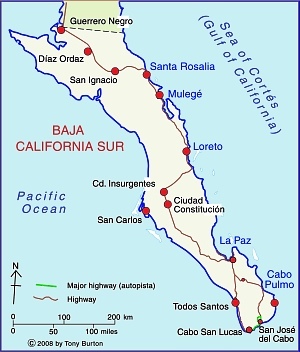 Baja California Sur has only five species while Baja California has 12. Mexico ranks fourth in the world in number of flowering plant species, behind only Brazil, Colombia and China. 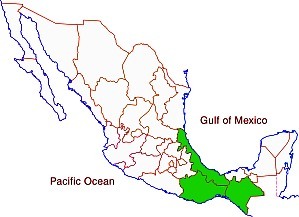 Veracruz is the clear leader with 4,907 species, followed by Chiapas (3,833), Oaxaca (3,388) and Jalisco (2,752). States with the fewest species are Aguascalientes (467), Tlaxcala (457) and Baja California Sur (484). Mexico is also among the world leaders in number gymnosperm (nonflowering plants – mostly conifers and other evergreens) species. Mexico has more species of pine trees than any other country. Veracruz leads with 31 species, followed closely by Nuevo León (30), Durango (29), Oaxaca (28), Hidalgo (27) and Chihuahua (26). Quintana Roo and Campeche have only one species while Colima and Yucatán have only two. Ferns are also an important part of Mexico’s biodiversity. Chiapas leads with 693 fern species, followed by Oaxaca (669), Veracruz (534), Guerrero (374) and Puebla (297). States on the Yucatán Peninsula have relatively few fern species: Yucatán (25), Campeche (29) and Quintana Roo (39). Source for the statistics in this post: Semarnat, El ambiente en números 2010, tabla 21: “Riqueza de grupos de species selecionadas, 2008” (CONABIO) (pdf document). After the conquest, Spanish settlers introduced numerous Old World species into the New World. The most pernicious introductions were human-borne diseases, which led to the rapid and tragic decimation of the indigenous population. However, most of the introductions were deliberate, made with the intention of increasing the diversity of available food and resources. Among the non-native (exotic) plants and animals introduced were sheep, pigs, chickens, goats, cattle, wheat, barley, figs, grapevines, olives, peaches, quinces, pomegranates, cabbages, lettuces and radishes, as well as many flowers. The environmental impact of all these introductions was enormous. The introduction of sheep to Mexico is a case in point. In the Old World, wool had been a major item of trade in Spain for several centuries before the New World was settled. The first conquistadors were quick to recognize the potential that the new territories held for large-scale sheep farming. 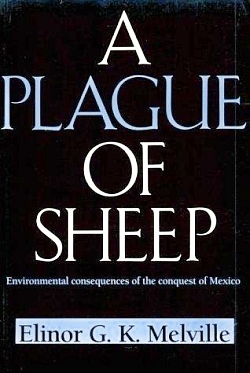 The development of sheep farming and its consequences in one area of central Mexico (the Valle de Mezquital in Hidalgo) was analyzed by Elinor Melville in A Plague of Sheep. Environmental Consequences of the Conquest of Mexico. Melville divides the development of sheep farming in the Valle of Mezquital into several distinct phases. Sheep farming took off during Phase I (Expansion; 1530-1565). During this phase, the growth in numbers of sheep in the region was so rapid that it caused the enlightened Viceroy, Luis de Velasco, to became concerned that sheep might threaten Indian land rights and food production. Among the regulations introduced to control sheep farming was a ban on grazing animals within close proximity of any Indian village. At first the Indians did not own any grazing animals, and consequently did not fence their fields, which inadvertently encouraged the Spaniards to treat the landscape as common land. During Phase II (Consolidation of Pastoralism; 1565-1580), the area used for sheep grazing remained fairly stable, but the numbers of sheep (and therefore grazing density) continued to increase. By the mid-1570s, sheep dominated the regional landscape and the Indians also had flocks. One of the consequences of this was environmental deterioration to the point where by the late 1570s, some farmers did not have adequate year-round access to pastures and introduced the practice of seasonal grazing in which they moved their flocks (often numbering tens of thousands of sheep) from their home farm in central Mexico to seasonal pastures near Lake Chapala. This practice of grazing on harvested fields or temporary pastures was known as agostadero. This term originally applied to summer (agosto=August) grazing in Spain but was adopted in New Spain for “dry season” grazing, between December and March. So important was this annual movement of sheep that provision was made in 1574 for the opening of special sheep lanes or cañadas along the route, notwithstanding the considerable environmental damage done by the large migrating flocks. As flock sizes peaked, more than 200,000 sheep made the annual migration by 1579. By 1579, and doubtless before, more than 200,000 sheep from the Querétaro region covered every September the 300 or 400 kilometers to the green meadows of Lake Chapala and the western part of Michoacán; the following May, they would return to their estancias. More than eighty thousand sheep come from other parts to pasture seasonally on the edge of this village each year; it is very good land for them and they put on weight very well, since there are some saltpeter deposits around the marsh. By the end of Phase III (The Final Takeover; 1580-1600), most land had been incorporated into the Spanish land tenure system, the Indian population had declined (mainly due to disease) and the sheep population had also dropped dramatically. Contemporary Spanish accounts reveal that this collapse was attributed to a combination of the killing of too many animals for just their hides by Spaniards, an excessive consumption by Indians of lamb and mutton, and by the depletion of sheep flocks by thieves and wild dogs. 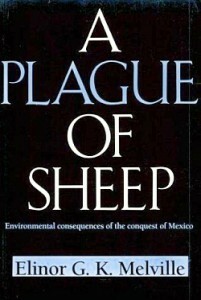 Melville’s research, however, suggests that the main reason for the decline was actually environmental degradation, brought on by the excessive numbers of sheep at an earlier time. The entire process is, in Melville’s view, an excellent example of an “ungulate irruption, compounded by human activity.” The introduction of sheep had placed great pressure on the land. Their numbers had risen rapidly, but then crashed as the carrying capacity of the land was exceeded. The carrying capacity had been reduced as (over)grazing permanently changed the local environmental conditions. By the 1620s, the serious collapse in sheep numbers in the Valle de Mezquital was over; sheep farming never fully recovered. The landscape had been changed for ever. Chevalier, F. Land and Society in Colonial Mexico. University of California Press. 1963. Melville, Elinor G. K. A plague of Sheep. Environmental consequences of the conquest of Mexico. Cambridge University Press. 1994. Click here for the original article on MexConnect. Mexico’s ecosystems and biodiversity are discussed in chapter 5 of Geo-Mexico: the geography and dynamics of modern Mexico. The concept of carrying capacity is analyzed in chapter 19. Buy your copy today, as a useful reference book! Mexican cuisine is extraordinarily varied and has become one of the most popular in the world. Diana Kennedy, the foremost authority on the subject, has devoted her life to researching the regional variations in ingredients, cooking methods and typical local dishes. The ingredients used reflect different climates and ecosystems (see Geo-Mexico chapters 4 and 5). For instance, corn (maize) tortillas predominate in southern and central Mexico while wheat tortillas are more commonly found in the north of the country. Pork and hominy stew (pozole) is largely restricted to the Pacific coast states of Jalisco and Guerrero. The grilled beef of cattle ranges in the northern interior of Mexico contrasts with the seafood found along the coast. Cuisines are strongly influenced by trade routes and migration, especially the arrival of immigrant groups. Mexican cuisine is a fusion of ndigenous and Spanish cooking, influenced in some regions by Cuban, Italian, French and other migrants. On a more local scale, miners from Cornwall in the UK who came to work in the silver mines of Real del Monte in the state of Hidalgo brought with them their meat and vegetable-filled pastries called Cornish pasties. These were quickly assimilated into the local cuisine, and pastis, admittedly with some chilies added, are still sold in the town.